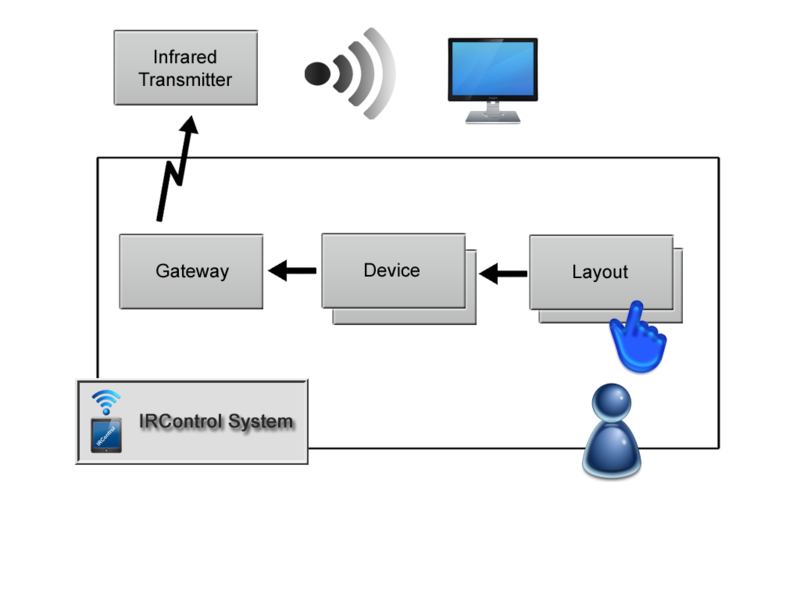 The following chart visualizes the system architecture of the IRControl system and its components. A gateway is a part of the programm of the IRControl system, that communicate with the infrared transmitter. You have to configure a gateway for each transmitter you want to access. Devices represents within the IRControl system the devices, you want to control (for example a TV). You have to configure for each of your devices you want to control such a device definition. You can control with a gateway as much devices you want (in IRContnrol). You have also to configure the device dependend infrared sequences while register a device. Layouts are definitions of the user Interface of IRContros. Layouts contains buttons and other graphical controls, which are linked with the command (infrared codes), that are configured for a device. The design capabilities for layouts are open for your personal requirements. You can access different devices from the same layout as well you can access a device form different layouts. Therefore it is possible the build e very flexibel, individual control system for your home electronic equipment. Let your imagination run wild for your own design.